Life, nature, and the human anatomy are made up of a series of chain reactions, where one cause can have multiple effects – just as a single domino can knock down multiple strands of thousands of subsequent dominos. The process of skin aging is also a chain reaction. SK-II scientists have discovered that seemingly unrelated signs of aging like wrinkles, sallowness, and sagging are all part of a complex web of skin aging, like an intricate system of dominos. And the starting point that connects it all – the critical domino – is the skin’s radical firmness. In a recent consumer study conducted by SK-II, it was revealed that the majority of consumers are unaware that loss of firmness is one of the first signs of aging. In fact, firmness of the skin is one of the first and fastest to decline when skin starts to age, and is the key factor in the inter-connected web of skin aging. 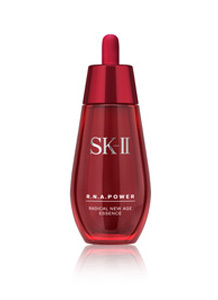 Radical firmness is the term used by SK-II to describe the springy nature of the skin’s core basal layer. In young, well-maintained skin, radical firmness is in its best condition and skin has a thick, elastic, and wavy basal layer. Aged skin that has experienced a loss of radical firmness, meanwhile, has a flat basal layer that lacks elasticity, and therefore deformations such as fine lines and wrinkles appear more obvious on the skin surface. SK-II scientists have discovered that improving the skin’s radical firmness from deep within the skin cells results in improvement in the other connected signs of aging. Taking control of radical firmness – the key to reversing skin’s aging appearance – triggers a domino effect into a chain reaction of renewal, improving the multiple signs of skin aging at the source of skin’s beauty. Years of research have led SK-II scientists to develop the powerful Stem-Acanax Complex, a combination of signature Pitera™ and Stem-Acanax – an ingredient derived from the root of the Siberian Ginseng and harvested from an organic farm in the heart of Korea’s Jeju Island. 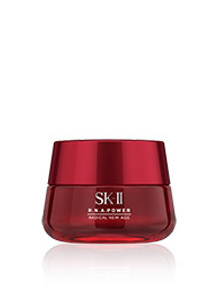 The SK-II Stempower series contains this groundbreaking formula which works to increase lift-protein in the skin, enhancing firmness and resilience, which in turn leads to an improvement in multiple skin aging concerns. Rather than simply treating individual attributes, the Stempower series addresses radical firmness at its source to treat multiple skin aging concerns – loss of firmness and tightened facial contours, lack of radiance and resilience, dryness, fine lines and wrinkles, sallow complexion, visible pores, sagging, and roughness. R.N.A. POWER RADICAL NEW AGE targets the skin’s radical firmness from deep within the skin cells to improve multiple aging concerns. After two weeks of use, skin’s radical firmness can improve by as much as 30%1, and this enhancement in radical firmness has been proven to improve multiple signs of aging2. R.N.A. POWER RADICAL NEW AGE ESSENCE fixes skin’s inner resilience and targets the early appearance of enlarged pores, one of the first signs of the loss of skin’s firmness, resulting in smoother skin texture and less visible pores after just one application3.